It's December in the Las Vegas desert and we need a farm fix fast! On a beautiful sunny Sunday morning we seek relief at the nearby year round Fresh52 Farmers Market. After sampling vegan cookies and devouring plant-based street tacos, we discovered the Bloomin' Desert Herb Farm. Randy Gibson explained that in nearby Henderson he and wife, Rosalind, grow over 50 varieties of herbs and edible flowers then use the bounty to create the teas, seasonings and more for sale at local farmers markets. Speaking with wild excitement about transforming his typical suburban driveway into a greenhouse and growing waist high basil, Randy noticed our excitement and kindly obliged the request to visit the farm. Left, the driveway greenhouse Randy built 3 years ago for about $120. Right, the backyard greenhouse features a roll up wall for easy climate control. We pulled into a typical suburban neighborhood with small yards and questioned if we had the address correct? How can there be a farm in this hood?? Then we saw a greenhouse in a driveway and knew that must be the place. Immediately we felt a connection with Rosalind as she provided the farm history. In 1996 the Gibsons relocated to Nevada from native Oklahoma, where they farmed 3 acres. The blank yard surrounding their newly built home in the desert soon had irrigation and fruit trees in the ground. After 4 years of building the soil they became a certified farm by the Nevada Department of Agriculture. Today, they grow the 50+ varieties of herbs, edible flowers & vegetables used to produce teas, seasonings & dozens of other products available at local farmers markets and restaurants. The magic alfalfa, shown above freshly applied to the backyard greenhouse garden beds. 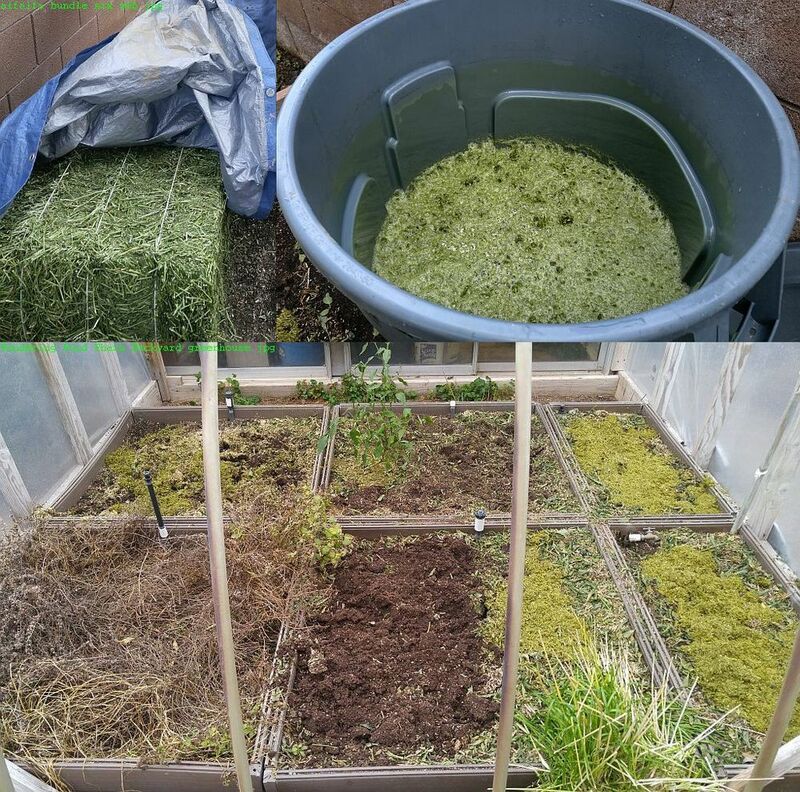 Beginning as a bale, when the alfalfa is mixed with filtered water magic happens. “There is a huge misconception of not being able to grow in the desert”, said Rosalind, a retired educator. “We would get 20 bushels per year from our peach tree...so much that neighbors were tired of receiving them!” Eliminating animal products such as fish emulsion from the garden became a priority after adopting a Plant-Based diet 5 years ago. “Welcome to the Vegan garden!”, Randy exclaimed, pausing from mixing non genetically modified alfalfa and filtered water in a garbage can. The mixture is worked into the garden beds and dramatically increases yield. “Soil is alive, and the soil LOVES it.”, said Randy, a retired contractor. The top producing herbs on this urban farm are lemon balm followed by mints, basil, oregano then rosemary. The last pepper harvest of the season ready to process into hot pepper shake and other seasonings. What about water? Rosalind said they have a water retention/control plan in place. The timing of watering (morning, afternoon, night) is important as is grouping plants with similar water needs. Their water bills are very reasonable even in midst of a drought. Rosalind said they are “very scientific about the farm” and keep yearly charts and journals. Pest control in the desert is straight forward; with few insects the biggest threats are lizards, ants and occasionally some aphids. Cayenne pepper or soapy water serve as natural pest control when needed. What about the neighbors, have there been any complaints about the greenhouse in the driveway? “Not one, the neighbors are interested and great sports”, answers Rosalind. In fact, a few neighbors have taken note and begun growing their own food...an incredible example of the ripple effect a suburban farm can have on a neighborhood. The Gibsons widen the ripple effect by giving tours to small groups of school children and others interested in farming. "Here, try this..." says Randy as he picks a lovely rose and offers a petal for sampling,"kinda sweet, isn't it?" Having never eaten a rose before, we naively asked if one can eat the roses from a flower shop. "Oh no, NEVER eat those because they're sprayed with chemicals." The roses are one of the 32 edible flowers grown on the farm for use in Rosalind's tea creations, some of which can be found at local restaurants. Rosalind & Randy standing in winterized basil bed. Rosalind and Randy reminisce about working their first farmers market in Mario Batali's warehouse. They've come a long way since that day 6 years ago. Reflecting, Randy said the farm is a “business and a lifestyle. I've done a lot of back breaking work in hay fields, on railroads, and I've never had a job take up more of my time than this farm. Just look outside and there is always something to do!” Rosalind summed it up by saying the lifestyle is “so gratifying”. The Blooming Desert Herb Farm is inspirational and serves as prime alternative to high input, inedible landscapes, like grass. Proof positive you don't need acreage or the perfect climate to have a farm; simply choose to be a farmer. Matt & Erica are Plant Based Advocates, Writers, & Wanderers. Always looking for plant based adventures, please Email suggestions! Older PostCommunity Gardens, Ya Dig?